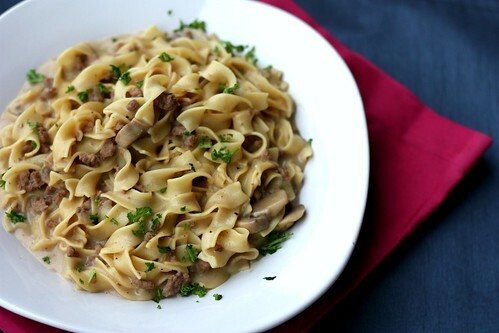 Skillet Ground Beef Stroganoff – Elly Says Opa! Like many people who grew up in the 80s, I’ve had Hamburger Helper. Like, a lot of times. Although it was pretty much “forbidden” when I was young, when I got to the age where I could stay home alone and make myself dinner, it went (heavy) into the rotation. And when I was in college and moved into my first apartment, it probably made an appearance more often than I cared to admit. My favorite flavor was the stroganoff. Dude, I freaking loved that stuff. Of course, as soon as I had “real” stroganoff, I realized what I was missing. I’ve made a few versions of stroganoff, including one with a fancy cut of beef, and one without. This time, though, I was yearning for the nostalgia of one-skillet-ground-beef-stuff-you-eat-in-college. For whatever reason, it sounded more comforting than the others (not to mention cheaper and quicker). This version most certainly did not disappoint. I increased pretty much everything but decreased the beef so this isn’t as meaty as the original recipe, but it was perfect for us. Creamy, comforting, delicious, awesome for leftovers, and flavored without the use of an envelope. 🙂 Also, why are egg noodles so much more awesome than regular noodles? I may never know. Heat a large saute pan with lid or a Dutch oven over medium high heat. Add the oil and, once hot, the ground beef. Don’t stir the beef; instead, let it brown on one side completely. Add the onions. Stir, breaking up the ground beef, until the beef is browned and onions are tender. Move to a bowl, draining any excess fat. To the skillet, add the mushrooms and a small pinch of salt (and a little more oil, if necessary). Cook until the liquid from the mushrooms has evaporated, about 8 minutes. Add the brandy and lift any browned bits from the bottom of the pan. Boil for about 1 minute before adding flour. Cook for 30 seconds; then, add the broth and bring to a boil. Stir in the noodles and the beef. Cover partially with a lid and cook, stirring occasionally, until noodles are tender, about 10 minutes. Off the heat, stir in the sour cream and lemon juice. Season to taste with salt and pepper.